Autonomous Underwater Vehicle (AUV) technology has significant research potential, specifically for harsh maritime environment operations. Memorial University of Newfoundland recognized this potential and in 2005 the University commissioned an International Submarine Engineering Explorer AUV to be built. 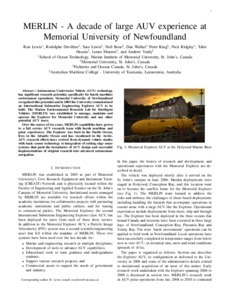 The Marine Environmental Research Lab for Intelligent Vehicles (MERLIN) was established to manage, maintain and operate the Explorer for Memorial University and any other potential AUV users. Over the course of ten years, MERLIN capabilities have grown to a full service AUV research team with harsh maritime and polar experiences. The Explorer was born in the Pacific Ocean, lives in the Atlantic Ocean and has vacationed in the Arctic. AUV research efforts have evolved from dynamic vehicle studies with basic sensor technology to integration of cutting edge sonar systems that push the boundaries of AUV design and successful implementations of original research into advanced autonomous navigation.